BendPak Lifts – 4 Post Lift Extra Wide – HD-9XL– 9,000 lb. Lifting Capacity - Gary Bloom Sales, Inc. The HD-9XL is the ideal 9,000-lb. capacity four-post lift for vehicles with longer wheelbases. In fact, the runways are about two feet longer than the runways on the standard HD-9. This 4-post lift variety is available with optional casters, dip-trays, jack platform and more. The HD-9XL four-post lift offers ample drive-thru clearance and lift height, but it features extended runways to accommodate longer wheelbases. It may be the width of a typical parking space, but this lift truly gets the most out of your valuable floor space. Use it for storing cars, trucks, ATVs, snowmobiles, jet skis, golf carts and just about anything with four wheels. All you need is an 8-foot ceiling, and this car lift makes use of all that empty space you’re currently wasting. An optional caster kit allows you to roll the lift anywhere you need it. 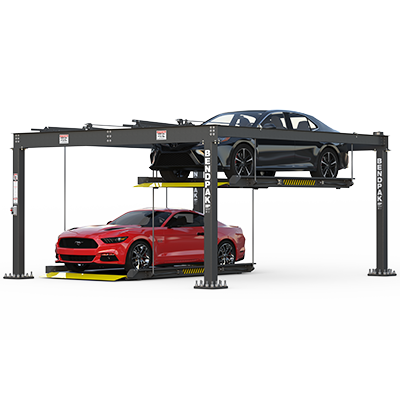 Put simply, this four-post lift provides a vehicle maintenance and parking solution that no other lift in its class can offer. The only way to hoist those longer vehicles is to invest in the BendPak HD-9XL. Rugged, dependable dual-hub cable sheaves are found on every BendPak, but not every lift out there has them. Why? They cost more to manufacture. That small extra cost is technically avoidable, but there’s a reason BendPak lifts last longer and perform better than other brands: we don’t cut corners with dinky single-hub sheaves. Double-hub all the way! 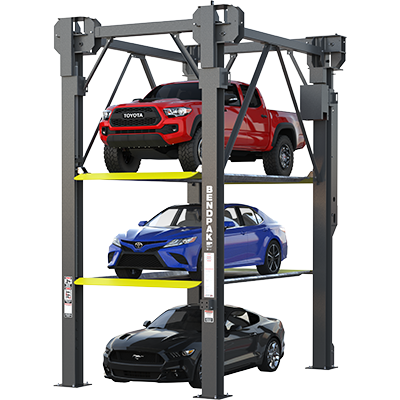 Whether you keep your four-post lift at home or operate from a professional shop, there’s no “one” perfect height for parking or service. Every few inches, the HD-9XL offers another mechanical lock position. This means you get to park low or high-clearance vehicles at just the right height. Plus, different technicians get to choose the working height that works for them. Boasting a 14,000-lb. weight capacity per cable, this four-post lift’s four cables can support 640% of the lift’s rated capacity. All cables run within the columns, out of sight but never inaccessible for regularly scheduled safety inspections. A BendPak power unit never requires maintenance. The controls are easy to access for your convenience. Plus, lifting, lowering or stopping the vehicle is as easy as pressing a button. This four-post lift features large, 10” x 12” base plates that can be bolted for extra stability or left unbolted for the caster kit. Either way, the larger surface area of the plates ensures everything you lift and lower will remain safe and stable at all times. Our 4-piece caster kit is the perfect addition to every model in the HD-9 series. It essentially turns a planted object into a mobile work station, which is extremely convenient for dozens of applications. 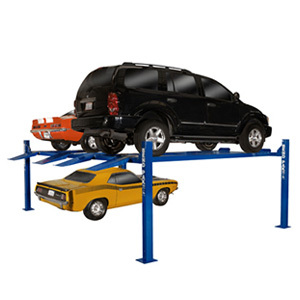 Need to move your lift into the middle of your garage for a job? Just roll it out and roll it back when you’re done. 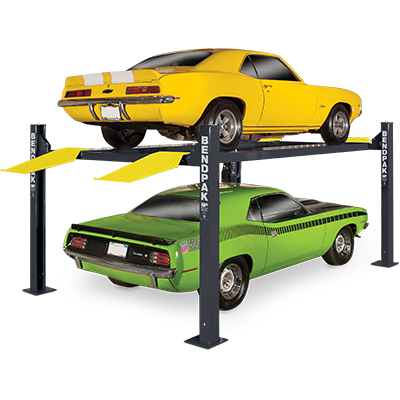 BendPak protects the integrity of your four-post lift by ensuring all moving parts stay on the inside of the columns. That includes the cables, safety latches and dual-hub cable sheaves. Other companies keep them on the outside, claiming it’s for safety reasons. The truth is that’s just an easier way to design the lift, not a smarter way. Internal components are easy to service and have the benefit for staying protected by the surrounding steel. 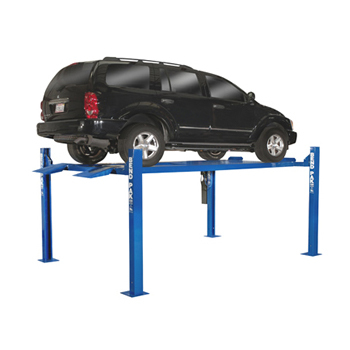 The HD-9XL car lift features low-profile runways that rise just 4.5” off the ground when lowered. Our simple, elegant design makes it easier to lift low-stance cars. The low runways of this four-post lift are complemented by extended approach ramps. Now you can load vehicles that practically scrape the ground. Just drive on, relax and lift! Mechanical locks are essential safety components on a BendPak four-post lift. The runways, connected to the lift carriages, automatically engage the locks as the lift ascends. Plus, a backup cable slack detection system will immediately stop the vehicle in the rare event of a cable failure or the development of excess slack.